When it comes to Rafal, the name of the game is intensity. Rafal spends every second of every chessgame completely focused and intense on the task at hand. This gives him the chance to score some very surprising victories over stronger players, as his hard work and determination often pays off. In the NY Masters he has already knocked off GM Maurice Ashley and IM Irina Krush. One thing you know about Rafal is that if you play 1.e4 against him, youd better be well versed in the Caro-Kann defense as this is his favorite opening. With the white pieces he likes to play 1.e4 and often essays some quiet variations. 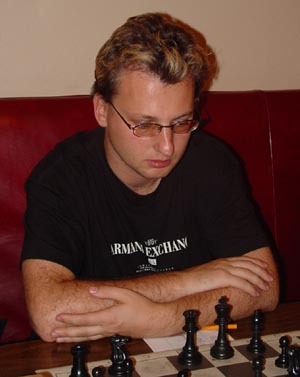 Despite the fact that his tecnique is not up to par with some of his higher rated competitors, he makes up for it by his intense concentration over the board. Because of this, he has recently knocked off GM Alex Stripunsky and has seen his rating soar back over the 2300 mark.